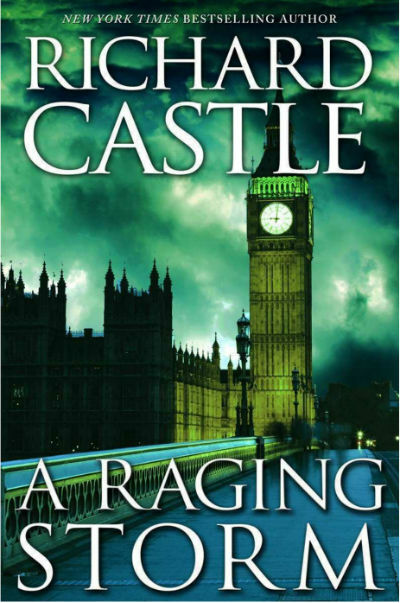 A Raging Storm is the second Derrick Storm short by fictional writer Richard Castle, which moves the story ahead from where it was left in A Brewing Storm. As the senator is dead in front of Storm and Showers accompanied by one more female field agent from FBI, the things are almost out of their hand. Their priority is to catch the shooter of course, but, after securing the late senator’s family member. The act quickly to get all them down, so shooter cannot target them. The description about the bullet-proof glass in the window of the senator’s office, and how it was unable to prevent the death of senator is written nicely. Especially, the words that says, it buys senator the chance to deliver his last words. Storm and Showers found that the place form where the shooting was happened, is nothing else but the rooftop of Police headquarter. On their way to catch the shooter in that build, they were stopped for the formal enquiry and all, which buy enough time for the shooter to leave in the disguise to the railway station. Here it is almost impossible to find him. From here the tale focuses into Russia, and if you are not aware of the political situations and brief history of the country, you might find yourself a little lost for a while. The description of the train station, its historical importance, the game played by an opportunistic and ambitious Russian politician, all will soon start make sense to you. The story then focuses to Briton, where Storm and Showers and sent to question a Russian diplomat about the death of senator. Showers somehow recognised by the media and soon became a part of telecast, revealing her identity. Storm however was able to hid his presence. Their meeting with the Russian diplomat, its effects and after effects, are written well, and it moves the plot ahead wisely. The Russian diplomat is considered as a kind of rebel who is set to address a public rally the next day. Storm and Showers were invited to the rally. Storm suspect something wrong is going to be happened at the rally. A group of assassin appeared who was intended to kill the Russian diplomat, and the plan was, to make it appear that the US FBI agent is responsible for that!!! Now the things are more complicated than they were thought. Will Storm and Showers be able to save the diplomat? Will they be able to survive themselves? Who wants to kill the Russian diplomat and Why? This “short” contains more descriptions (especially about various landmarks from Briton Russia). The background into politics of Russia – is written pretty well too. The meeting between the Russian diplomat and Showers and Storm is written well. Storm is acting as per the additional instructions given to him by Jedidah Jones, which makes Showers to feel that she cannot fully trust Storm. The situation gets a little tense between them at various places. These situations are explored nicely by the writer. The chases are written pretty well. The challenge to explore the things in a few pages, making them interesting and maintaining a good pace; is definitely a challenging work. The ghost writer (well, as Richard Castle is a fictional writer, and the true identity of the actual writer who wrote under this pseudonym is not revealed, what else can we say?) succeeds in his job for sure. This book provides you a good short time read. And if spy fictions are what you found exciting, you will like it for sure. You though, want more pages in the book. So, it is all set for the third part! Are you curious to explore it? We definitely were all motivated and read the entire trilogy. We will be sharing our reviews and a brief of the content for those parts soon. So keep visiting us.